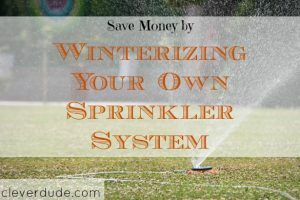 Every fall I get the letter in the mail asking if I want a local irrigation company to come and winterize my sprinkler system. I’ve seen my neighbors get the service. A truck pulling a huge air compressor on a trailer parks in front of their homes. They hook up a hose, and 20 minutes later it’s all over. Every year I rip it the letter in half and throw it in the garbage. I will not be paying the $108 dollars for them to come and blow out my lines because I know how to do it myself. Air compressor : I borrow an 11 gallon compressor from a friend of mine. Anything smaller won’t work very well, but anything bigger will reduce the amount of time it takes to complete the task. Valve / Nozzle Combination : Valve is probably the wrong term, but you can see the item pictured here. I picked up both of these parts at my local hardware store for less than $10 and have been using them for 9 years now. Extension cord: The electrical cord on the air compressor is usually pretty short. 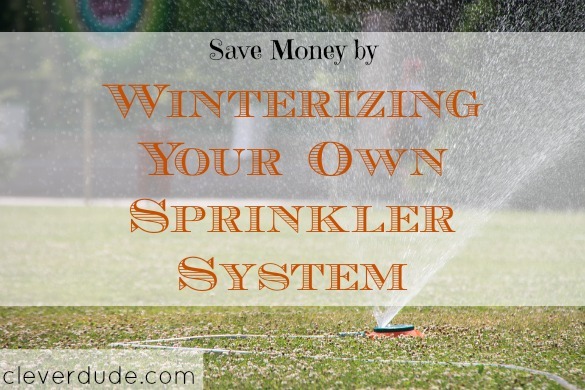 Turn off the water to the sprinkler system. The lever to do this is usually found indoors in the mechanical room of your home. Locate the valve bolt on the water line to your system on the exterior of your home. Remove the valve bolt, and insert the valve / nozzle combination. Plug in and turn on the air compressor. Let it fully charge until it stops running. 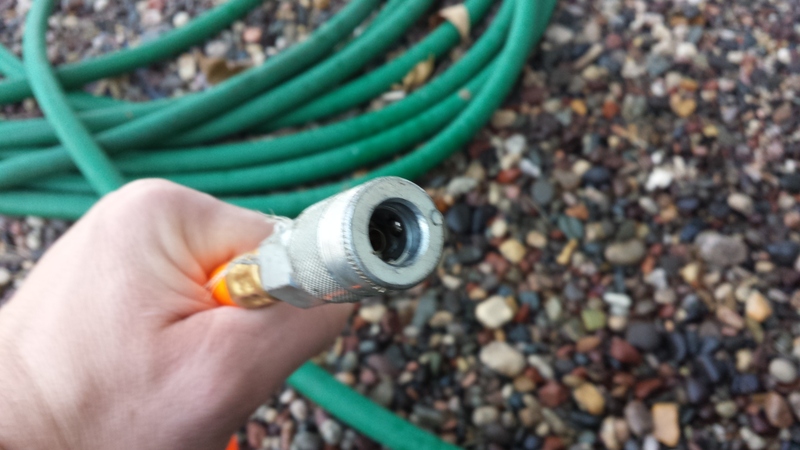 Attach the compressor hose end to your valve/nozzle. 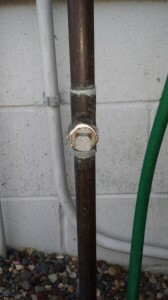 Your sprinkler heads will pop up, with the pressurized air pushing the water through the heads. Let it run until either a.) 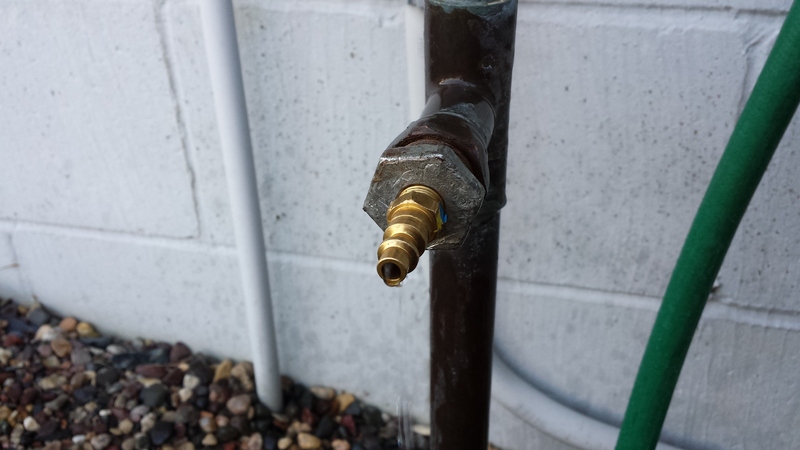 only air is coming out of the sprinkler heads, or b.) the pressure in your air compressor is completely exhausted. Remove the compressor hose from the valve / nozzle combination. Let the compressor recharge completely. If there was still water coming out of the heads when you removed the hose from the valve/nozzle combination repeat this sequence with the same zone. If there was no water coming out of the heads when you removed the hose, then increment your control panel to the next zone and continue. Because the air compressor I used was much smaller, it took me about two hours to complete the task. I didn’t mind, however, because this time of year I spend my Sunday afternoons watching football and I can easily run outside for a few minutes occasionally to do the next iteration. It’s certainly a lot easier than writing out a check for $108. Have you ever blown out your own sprinkler lines? How did it work for you? I don’t do my own but mine is $40 and they get it done in such a short amount of time that I have not questioned this cost. I just stick aside $3 or $4 per month in an allocation on our financial tracking spreadsheet and it doesn’t even cause a blip. 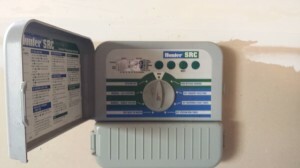 @MoneyBeagle – for $40 I might pay to have it done too. They charge by the # of zones (I have 9, and they charge $12 a zone) so that would mean I would have half as many zones so it would likely only take me an hour….hmmm, I’m still on the fence. 🙂 Thanks for your thoughts! We don’t have a sprinkler line, so that problem is solved pretty quickly. We get flyers for services like this all the time – from gutter cleaning ( we do that ourselves) to house cleaning (it’s our mess, we can clean it up), and they are always at a steep price. I would do the same as you if the company was charging $108. Just had ours done and it cost $57 after tax and I happily pay it. It’s really recommended that you have a better air compressor than a standard garage one because they can leave water in your lines due to too low of volume, or put too much pressure through the lines and that leads to bad things. It can also be kind of dangerous. This is one thing I leave to the pros! @Daisy – It goes to show you…..you can pay someone to do just about anything for you – but you can save money to do it yourself. Thanks for your thoughts! @Dan – I’ve been blowing out my own sprinkler system for 9 years and have never run into any problems. I blow each zone out until there’s absolutely zero water coming out the heads so I doubt there’s any water left in the lines. I think as long as I ensure all the water is pushed through I don’t have anything to worry about. thanks for your perspective! Ha – great write-up. Very similar to mine 🙂 Also, I just got a free Xbox 360 very similar to your recent post. Are you my long lost twin or something?!? @MoneyAhoy – LOL…long lost blogging twins – could be! Great to have connected, and looking forward to seeing how many other things we have in common! We just paid someone $60 flat to do this for us. The main reason I have someone else do it is that I’m a California kid who never had to do this until moving to Denver (SNOW). I’m scared to death of freezing the pipes out. Great step-by-step I will have to apply next fall. I know it’s a huge waste o’ money on my part so I need to learn and save.